New Year’s Eve has been known for some crazy parties. We all like to get dressed up and go out with our friends and loved ones and celebrate a great year. There is dancing and laughing and the drinks are always flowing. This year, why not put a cherry on top of a great evening with a charter bus rental. Also, known as a party bus, this is a great way to have a safe, fun night on the town. When the night involves drinking, the responsible thing to do is to designate a sober driver. But that usually means that the designated driver (DD) can have little to no alcohol for the whole night. That’s not always fun. With a charter bus, all of your favorite people can enjoy themselves and still arrive home safely. 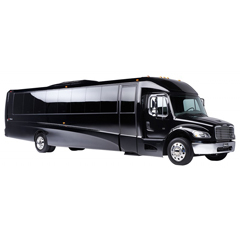 One of our party buses can hold up to 56 passengers and all of them can have a blast on the ride to the destination. This means that you can invite all of your friends and their significant others and still have room to invite your family to come along. Invite as many people as you would like and if it suits you, have them chip in on the cost of the rental. The party buses at LCS Limousine and Travel have mood lighting so that you can feel like you are already in the bar or club while you are driving down the road. Passersby are sure to stop and stare as you head towards them and become envious of the great time you are having. So before you head out this New Year’s Eve, make sure you and your party gets there and back safely by renting a charter bus. Call LCS today.